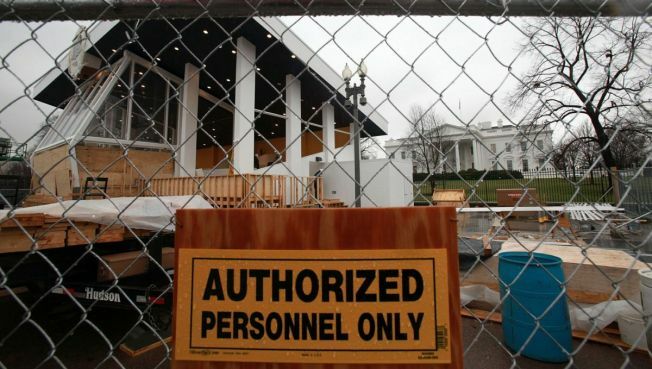 Work continues on President elect Barack Obama's Inaugural Reviewing Stand on Pennsylvania Avenue in front of the White House. Over 1.5 million people are expected to visit DC on January 20 to see Obama being sworn in. Homeland Security Secretary Michael Chertoff said security concerns during inaugurations have been elevated since the 2001 terror attacks. "I think it will be the most security, as far as I'm aware, that any inauguration has had," Chertoff said in an interview with the AP. "We have scrubbed very hard to look at anything that would suggest a credible, imminent threat or one that was specifically focused on the inauguration," Chertoff said, though not referring to the intelligence assessment. "We're not, at this point, aware of a credible, specific, imminent threat that would affect the inauguration." While intelligence officials have seen no credible threats to the event from international terrorists or domestic terrorists, al-Qaida and its affiliates remain a threat to U.S. interests within the country and abroad, and the significance of Obama's presidency raises the potential threat from hate groups.